Anderson suggested Friday on Twitter that he doesn't expect to re-sign with the Rams. Anderson had seven carries for 22 yards and two catches for 12 yards on three targets in a 13-3 loss to New England in the Super Bowl. Anderson (illness) practiced in full Friday and didn't have a designation on the Rams' injury report, Lindsey Thiry of ESPN.com reports. Anderson didn't practice Thursday due to an illness. Anderson rushed 16 times for 44 yards and brought in his only target for five yards during the Rams' 26-23 overtime win over the Saints in Sunday's NFC Championship Game. Anderson rushed for 123 yards and two touchdowns on 23 carries during Saturday's 30-22 win against Dallas. Although Todd Gurley (knee) is expected to return for the Rams' divisional-round matchup on Saturday, Jan. 12, Anderson may keep a steady role within the offense, Myles Simmons of the team's official site reports. Anderson rushed 23 times for 132 yards and a touchdown while catching all three targets for 22 yards in Sunday's 48-32 win over San Francisco. 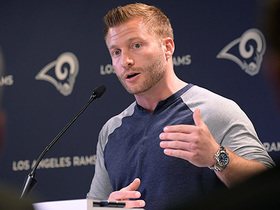 Coach Sean McVay called Anderson the Rams' starting running back for Sunday's game versus the 49ers in the absence of Todd Gurley (knee), Myles Simmons of the Rams' official site reports. 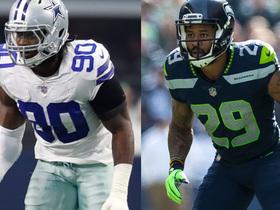 Analysis: The decision to hold out Gurley for a second consecutive contest likely was made easier by Anderson's performance Week 16. After less than a week of practice with his new squad, Anderson ripped apart the porous Cardinals run defense for 167 yards and one touchdown on 20 carries. He'll attempt to approach those numbers against a San Francisco unit that has allowed 23.4 rushes for 99.8 yards and one TD on the ground per game to running backs over the last five outings. 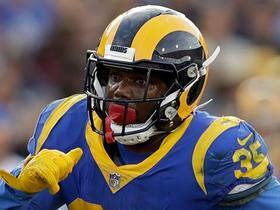 Anderson rushed 20 times for 167 yards and a touchdown and brought in one of three targets for minus-5 yards in the Rams' 31-9 win over the Cardinals on Sunday. Anderson is expected to earn the start at running back Sunday against the Cardinals if Todd Gurley (knee) is unable to play, Lindsey Thiry of ESPN.com reports. Coach Sean McVay said Wednesday that Anderson may "play a role as early as this week" against the Cardinals, Andrew Siciliano of NFL Network reports. 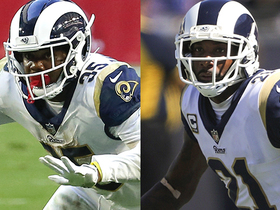 Analysis: The reality of the Rams backfield bodes well for Anderson making his team debut just five days after signing with the organization. Both Todd Gurley (knee) and Justin Davis (shoulder) were held out of Wednesday's walk-through practice, leaving all the backfield reps to John Kelly and Anderson. McVay expects Gurley to suit up for Sunday's contest at Arizona, but Anderson could be in line for carries within an offense ranked second in yards per game and third in points per game. The Rams signed Anderson on Tuesday, Mike Garafolo of NFL Network reports. 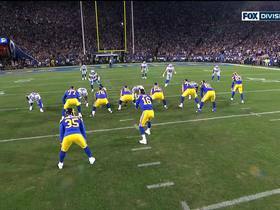 Analysis: At the moment, the Rams backfield is banged-up -- most notably Todd Gurley, who is dealing with an inflamed knee. Reserve running back Justin Davis also has a shoulder injury, so Anderson arrives to provide a veteran presence with postseason experience. In nine games with the Panthers this season, Anderson averaged 4.3 YPC on just 24 rushes but is one year removed from the only 1,000-yard campaign of his career as a member of the Broncos. The Raiders parted ways with Anderson on Tuesday, Field Yates of ESPN reports. Analysis: Anderson didn't have long to gain a foothold in the Raiders backfield, lasting just a week in Oakland before the two sides went their separate ways. The veteran running back has now departed from two different teams this season, taking the field for just 55 offensive snaps over nine games for Carolina prior to being released by the Panthers earlier. Given that he racked up a career-high 1,007 rushing yards in 2017, there may still be some teams out there interested in adding Anderson as depth. Anderson is inactive for Sunday's game against the Steelers. Analysis: Anderson being inactive Sunday suggests that Doug Martin (knee) should be able to handle his usual duties, with Jalen Richard and DeAndre Washington on hand to work in complementary roles. Coach Jon Gruden said the decision to sign Anderson on Tuesday was partially a product of Doug Martin's knee injury, Matt Schneidman of The San Jose Mercury News reports. Analysis: Alas, Martin was a full participant at Wednesday's practice and now looks like a strong bet to play Sunday against Pittsburgh. The Raiders may still carve out some carries for Anderson over the final four games, but it wouldn't be wise to count on any significant volume coming his way this weekend. Anderson signed a contract with the Raiders on Tuesday, Adam Schefter of ESPN reports. Anderson is scheduled to visit the Chiefs on Monday, Josina Anderson of ESPN reports. 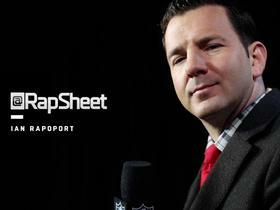 Anderson worked out for the Lions on Tuesday, Adam Caplan of SiriusXM Radio reports. Anderson was waived by the Panthers on Monday, Max Henson of the Panthers' official site reports. Analysis: With Christian McCaffrey handling a 96.3 percent snap share, Anderson presumably was frustrated with a role much smaller than what he signed up for in the offseason. The 27-year-old shouldn't have much trouble finding work, as he averaged 4.3 yards on 24 carries for the Panthers after producing the first 1,000-yard rushing season of his career with the Broncos in 2017. Anderson might provide an immediate upgrade in the backfield for Philadelphia or Tampa Bay. Anderson lost one yard on his two carries in Week 10's loss to the Steelers. Analysis: Anderson has now been given just 24 carries through nine games, emphasizing his small role behind starting tailback Christian McCaffrey. Anderson rushed one time for one yard in Week 9's win over the Buccaneers. Analysis: Anderson played just three snaps on offense, returning to a peripheral role after getting five carries the previous game. Halfway through the season, Anderson is averaging under three touches per game, evidencing his lack of involvement behind all-purpose starter Christian McCaffrey. Anderson rushed five times for 20 yards in Sunday's 36-21 win over the Ravens. Analysis: Anderson's workload was his highest since Week 1. In fact, it marked the first time he was handed any carries since Week 5. While he's done well in his limited opportunities, averaging an even 5.0 yards per carry, Anderson's small share still severely restricts his value. Anderson did not get any touches in Sunday's 21-17 win over the Eagles. Analysis: Anderson played just three offensive snaps, but that shouldn't be surprising considering how sparingly he's been used since joining the Panthers this season. Unless something were to happen to Christian McCaffrey, the veteran backup figures to remain in a restricted role. Anderson rushed four times for nine yards in Sunday's 33-31 win over the Giants. Analysis: Anderson continues to play a bit part as Christian McCaffrey's backup, featuring for only eight offensive snaps Sunday. Through four games, he's been handed just 16 carries, gaining a respectable 84 yards. Anderson rushed twice for nine yards and added a 24-yard touchdown catch on his lone target in Sunday's 31-21 win over Cincinnati. Analysis: Anderson was out-touched 30-3 by Christian McCaffrey in this one, but the backup running back made the most of his meager workload. The highlight of Anderson's day was definitely a screen pass that he took 24 yards to the house while barely getting touched. The veteran running back will be hoping the coaching staff incorporates him into the offense more after next week's bye. Anderson rushed three times for 31 yards in Sunday's 31-24 loss to the Falcons. Analysis: Anderson's total was boosted by a 22-yard run, which marked Carolina's longest play on the ground. He was also targeted twice, but couldn't haul in either attempt. The veteran was on the field for just eight offensive snaps, again emphasizing his backup role to Christian McCaffrey, who finished with 22 touches while missing just four plays. Anderson (illness) practiced fully Thursday, Max Henson of the Panthers' official site reports. Analysis: Anderson has put the illness that forced a DNP on Wednesday behind him. As the top backup to Christian McCaffrey, Anderson handled 12 offensive snaps Week 1 against the Cowboys, compiling seven carries for 35 yards. If the breakdown of red-zone runs is any indication -- Anderson matched McCaffrey with two rushes, or one less than Cam Newton -- a clear-cut goal-line option has yet to emerge in Carolina. Anderson (illness) returned to practice Thursday, Joe Person of The Athletic reports. Anderson didn't practice Wednesday due to an illness, Bryan Strickland of the Panthers' official site reports. Analysis: Considering he's likely dealing with only a short-term concern, Anderson is a good bet to get past the ailment before Sunday's divisional matchup with the Falcons. Working behind Christian McCaffrey in the Week 1 victory over the Cowboys, Anderson earned 12 offensive snaps, which he parlayed into seven carries for 35 yards. Anderson (undisclosed) wasn't spotted at practice Wednesday, Joe Person of The Athletic reports. Analysis: It remains to be seen if this is a maintenance day for Anderson or if he's dealing with any sort of injury. The 27-year-old logged 12 snaps in the Panthers' Week 1 win over the Cowboys, working as the clear backup behind Christian McCaffrey (57 snaps). Anderson at least received ample work when he was on the field, carrying seven times for 35 yards. Anderson rushed seven times for 35 yards in Sunday's 16-8 win over the Cowboys. Anderson gained 39 yards on eight carries and nine yards on two catches in Friday's preseason game against Miami. Bill Voth of the Panthers' official site compares the offseason addition of Anderson to the team's signing of Stephen Davis in 2003. Anderson signed with the Panthers on Monday, Joe Person of The Charlotte Observer reports. Analysis: The fit makes a lot of sense, as the Panthers otherwise would've been counting on Cameron Artis-Payne to replace Jonathan Stewart (Giants) as the power complement to Christian McCaffrey. Anderson was released by Denver just under a month ago to save cap space, despite reaching 1,000 rushing yards for the first time in his career last season. He should form an effective duo with McCaffrey, whose fantasy outlook takes a hit with this signing. Anderson has drawn interest from eight teams in free agency, Mike Klis of 9News Denver reports. The Broncos are releasing Anderson, Mike Garafolo of NFL Network reports. The Broncos had a verbal agreement earlier this offseason to trade Anderson to the Dolphins for right tackle Ja'Wuan James, Troy Renck of Denver 7 ABC reports. Broncos general manager John Elway maintains that Anderson may or may not be back with the team for 2018, Mike Klis of 9News Denver reports. "C.J. obviously had a great year for us last year," said Elway. "We'll see where that takes us. Obviously, there's a lot of moving parts to it when you talk about the (salary) cap and all those type things, too, so we'll continue to work on it and see what happens." Broncos general manager John Elway was noncommittal Wednesday when asked if Anderson would return to Denver in 2018, Nicki Jhabvala of The Denver Post reports. "I'm not saying [Anderson will] be back for sure, but I'm not going to say [he's] gone," Elway said. Anderson finished the season with 1,007 yards and three touchdowns on 245 carries and 28 catches for 224 yards and a touchdown during the 2017 season. He lost one fumble on the year. Anderson ran for 61 yards on 18 carries during Sunday's 27-24 loss to the Chiefs. Analysis: Anderson's yardage brought him to 1,007 on the year - his first 1,000-yard season. After he reached the total, Denver sat Anderson to get a look at Devontae Booker and De'Angelo Henderson. The move might have been more than symbolic. The Broncos can either pay Anderson $4.5 million next year or let him walk with no cap penalty. With two promising young backs and plenty of holes to fill, Anderson likely carried the ball for the last time in orange. Anderson pounded the ball for 88 yards and a touchdown on 16 carries and added 45 yards on seven catches during Sunday's 27-11 loss in Washington. He added a two-point conversion during the contest. Anderson rushed 30 times for 158 yards and failed to bring in his only target in Thursday's 25-13 win over the Colts. Analysis: The 26-year-old saw almost three times the rushing touches of backfield mate Devontae Booker, reconfirming his status as the clear-cut lead back. Anderson's rushing yardage was easily his highest of the season, and he's now logged 52 rushes overall in the last pair of contests. He'll look to continue parlaying his robust volume into strong production when he faces the Redskins in a Week 16 road tilt. Anderson carried the ball 22 times for 48 yards and caught both passes directed his way for 25 more yards in Sunday's 23-0 win over the Jets. Analysis: That many carries in a blowout victory might have deked Anderson's fantasy owners into thinking he'd had a big day, but he was only able to manage 2.2 YPC. On the plus side, Devontae Booker had a similarly poor day with just 22 yards on nine carries. Meanwhile, the 26-year-old touched the ball more than he had since Week 4 and probably will retain the feature-back role heading into a favorable Week 15 matchup with Indianapolis. Anderson rushed 15 times for 67 yards and brought in four of seven targets for 43 yards in Sunday's 35-9 loss to the Dolphins. Anderson ran for 12 yards on five carries during Sunday's 21-14 loss to Oakland. Analysis: The five touches were by far a season low for Anderson. There may be further depths for Anderson to explore. Sunday's loss effectively knocked Denver out of contention and December will be all about trying to figure out what the team has going into 2018. To that end, Devontae Booker is far more likely to be on the team next season than Anderson. The transition seems to be starting as Booker saw 26 offensive snaps to Anderson's 19 on Sunday. Anderson carried 13 times for 37 yards and a touchdown during Sunday's 20-17 loss to the Bengals. He also caught two of three targets for 19 yards. Anderson rushed for 54 yards on 10 carries and added a one-yard catch in Sunday's 41-16 loss to New England. Anderson (ankle/illness) was a full practice participant Friday and doesn't have an injury designation for Sunday's game against the Patriots. Analysis: Anderson was limited Wednesday and held out entirely Thursday, with his illness (not his ankle) seemingly responsible for the absence. Although his health isn't a major concern, Anderson's workload has suffered in recent weeks as the Broncos have struggled to stay competitive while also reintegrating Devonta Booker into the offense. Anderson averaged 11.8 carries and 0.5 catches over the past four games, compared to 18.3 carries and 2.5 catches through the first four weeks of the season. 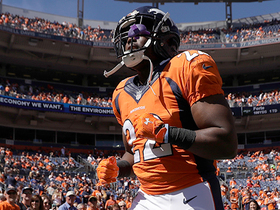 Anderson (ankle/illness) returned to practice Friday, Mike Klis of 9 News Denver reports. Analysis: Anderson did not practice Thursday due to his illness, but it appears he is at least feeling good enough to get on the field Friday. His ankle injury could still land him on the Broncos' final injury report of the week, however. 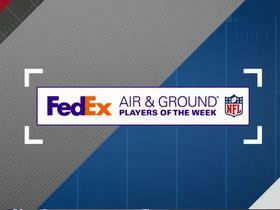 More details about his Week 10 status will be released after Friday's practice comes to a close. Anderson, who was limited at Wednesday's practice by an ankle issue, did not practice Thursday due to an illness, Troy Renck of Denver 7 News reports. Analysis: Fantasy owners will want to check back and see if Anderson recovers in time to practice Friday, but it's still expected the running back will be able to suit up Sunday against the Patriots. Given that Anderson was under the weather Thursday and was previously nursing an ankle issue, it's plausible that the Broncos will list him as questionable on their final Week 10 injury report, which will be released following Friday's practice. Anderson (ankle) was limited at Wednesday's practice. 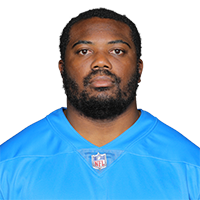 Analysis: Anderson is coming off a nine-carry, 13-yard dud in Sunday's 51-23 loss in Philadelphia, but as long as his ankle doesn't affect his Week 9 availability, he'll look to rebound this weekend against a New England defense that has allowed an average of 121.5	rushing yards per game to date. Anderson rushed for 13 yards on nine carries in Sunday's 51-23 loss in Philadelphia. 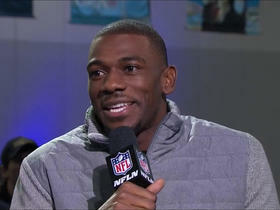 Listen as Denver Broncos running back C.J. Anderson is mic'd up against the Indianapolis Colts in Week 2 of the 2016 NFL season. Los Angeles Rams running back C.J. Anderson says "I'm the freshest RB in the league" in comparison to the Saints running backs. Los Angeles Rams running back C.J. Anderson's improbable journey to becoming the Rams' playoff hero. 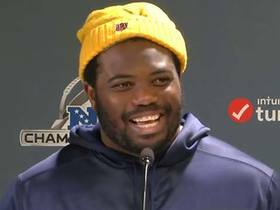 See Los Angeles Rams running back C.J. Anderson's highlights from the NFC Divisional Game against the Dallas Cowboys. NFL Network's Jim Trotter explains how the addition of running back C.J. Anderson and return of cornerback Aqib Talib will factor into the Los Angeles Rams' NFC Championship Game matchup with the New Orleans Saints.